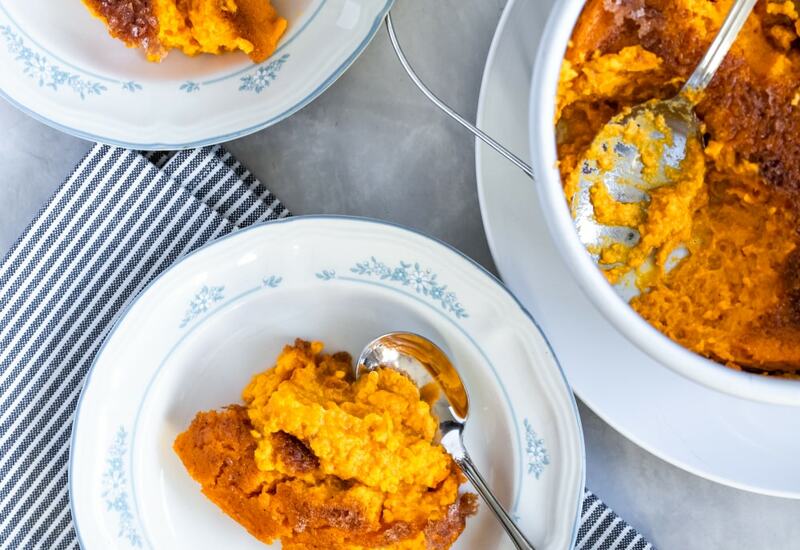 A sweet potato soufflé is a delightful addition to the Thanksgiving table or as a dessert on cold fall evenings. The sweetness of sweet potatoes and apples cook into a buttery soufflé in the pressure cooker, producing a perfectly cooked side dish or dessert. Your dinner and holiday guests will definitely be asking for the recipe! Combine sweet potatoes, apples, milk, and softened butter in the inner steel pot of a pressure cooker. Lock pressure cooker lid in place and set steam vent to Sealing. Select Pressure Cook (Manual) and cook for 15 minutes on High Pressure. Turn steam vent handle to Venting to quick-release pressure. Remove lid and add ½ cup white sugar, salt, and nutmeg. Mash the mixture with a potato masher and transfer to a deep bowl. Blend sweet potato mixture using an immersion blender until the mixture is creamy, about 4 minutes. Let mixture cool at room temperature about 10 minutes. Place egg whites and egg yolks in separate bowls. Whisk egg whites to a stiff peak using the whisk attachment of an immersion blender. Stir egg yolks into the sweet potato mixture until well mixed. Gently fold whisked egg whites into sweet potato mixture. Fill each pan ¾-full with sweet potato mixture. Pour 2 cups water into the inner steel pot of pressure cooker. Place the trivet into the pressure cooker and stack pans onto the trivet. Lock pressure cooker lid in place and set steam vent to Sealing. Select Pressure Cook (Manual) and cook for 20 minutes on High Pressure. Turn steam vent handle to Venting to quick-release pressure. Mix ½ cup white sugar and cinnamon together in a bowl. Remove lid from pressure cooker and carefully remove the pans; sprinkle cinnamon mixture onto each souffle. Place pans under broiler to brown topping mixture for 1 to 2 minutes, if desired. Try pears in place of the apples for a different flavor. Add cinnamon to the sweet potato mixture for extra flavor. Serve this dish with homemade whipped cream for an extra fancy dessert. Per Serving: 461 calories; 15g fat; 77.6g carbohydrates; 7g protein; 105mg cholesterol; 363mg sodium. Classic sweet potato flavors that I love. Simple and delicious. This was my first time incorporating apples, and I'm wondering why I never thought of that combo sooner?! Really good.